Home » Why Does My House…? 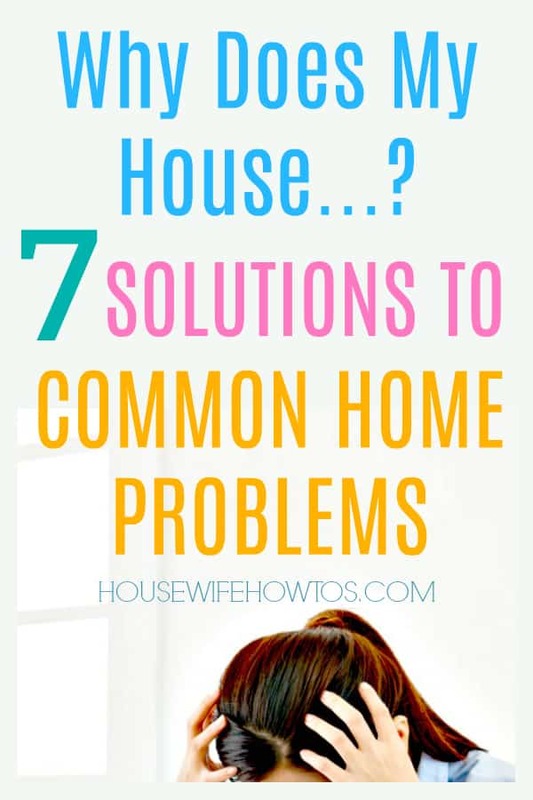 Answers to Common Household Problems. Pretty much every one has found themselves frustrated, head in hand, wondering why does my house…? So, you’ve got questions about your house. I’ve got answers. Whether it’s mystery odors or stains, odd sounds, or messes that you can’t get under control, you’ll find help here today! Keeping your home clean and in good shape isn’t easy. Even if you just moved in, there are bound to be things about your new home that you didn’t expect. For those of us who’ve lived in our homes for years, even decades, there are plenty of surprises, too. Maybe it smells odd when you walk in the door, or the floor suddenly begins creaking. Find the answers to these problems and more today. Why Does My House Smell Funky? There are generally two causes for household odors: moisture or bacteria. If you notice a musty, powdery scent when you walk in the front door, chances are you’ve got a mold or mildew problem. Check out the walls and corners in your basement, if you have one, for signs of water damage. Also, inspect under sinks and around the base of toilets. Treat mold or mildew yourself, or call a professional to remove it. If it’s a more pungent smell, start by cleaning your drains and your garbage disposal to remove greasy buildup and food residue. Then, wash your trash cans, preferably on a sunny day when they can air-dry. Why Does My House Cost so Much to Heat or Cool? You know that inadequate insulation, old single-pane windows, and poorly-fitting doors all contribute to higher utilities. Even if your home is newer, though, there may still be cracks around windowsills and pipes that allow in outside air. To find out if you need to caulk these areas, light a candle or stick of incense on a breezy day and hold it near the edges of your windowsills or where pipes enter the house. If the smoke or flame flicker it’s time to break out the caulk gun. Once those gaps are sealed, look into other frugal ways to stay warm in winter or keep your cool in summer. Why Does My House Get so Dusty? The majority of dust in our homes gets tracked in on the bottom of our shoes. Adopting a “No Shoe Policy” helps enormously. Other ways to reduce dust include vacuuming correctly and doing so at least once a week. You may also find relief by cleaning your own air ducts or having a pro do it for you. Why Does My House Squeak When I’m Walking Around? Most homes have wood subfloors. Wood can dry out and shrink during the winter, causing the floorboards to rub against each other. Check your home’s humidity levels and take steps to maintain proper indoor humidity. (This will help reduce dust, too.) If your humidity levels are in the appropriate range, the floorboards may need to be tightened. Why Does My House Have Mice or Bugs? Your home is nice. Pests want to make your home theirs. Caulking the gaps around windowsills and pipes, adding weatherstripping to doors, and keeping your doors shut will help keep them out. To get rid of mice naturally, you should also look at the junction between your home and foundation and seal any gaps there, too. Maintaining strict cleanliness in the kitchen and pantry will help get rid of cockroaches (and so will this DIY Cockroach Killer), while using peppermint essential oil in your homemade cleaning mixes will drive away spiders. Why Does My House Get so Cluttered? The short answer is: because people live in your home. Assuming you can’t kick everyone else out, you need to address your Clutter Hot-Spots and adopt a daily clutter-busting routine. Once you’ve tackled those hot spots, make ending clutter for good a goal you pursue without fail. Why Does My House Never Stay Clean? No home stays clean all of the time. It takes work, day in and day out. That doesn’t mean you’ve got to break out the vacuum and scrub bathrooms every day, but it does mean you need to give your home daily attention. A nightly kitchen-cleaning routine will reset the most important room in your home to a tidy, orderly place in minutes. To get your whole house looking just-cleaned, adopt a 20-minute daily cleaning routine to tidy the standard messes. When you clean weekly, even if it seems clean, you’ll find it takes just minutes instead of hours. Weekly cleaning with my free printable cleaning checklists is easy!